I'd never before tried any of the Sachajuan hair products when I got these, but I was instantly drawn in by the packaging. The sleek brown bottles with white, minimalist labels stand out among other haircare products in loud, garish, sometimes neon packaging. Sachajuan Thickening Shampoo & Conditioner great - they're everything you want from haircare products. They smell great and a little goes a long way. The shampoo lathers perfectly, while the conditioner detangles and moisturizes the hair very nicely. Using ocean silk and thickening technology, these products leave hair more voluminous while maintaining and boosting its silky smoothness... There's no frizz and unlike some thickening hair products, it doesn't leave the hair hard to manage, brush or blow dry. After using Sachajuan Thickening Shampoo & Conditioner, my hair always feels smooth and normal, but the increased volume is noticeable... In short, my hair looks great when I use these products. There's also a UV protection element, which makes these products perfect for summer or sunny holidays. 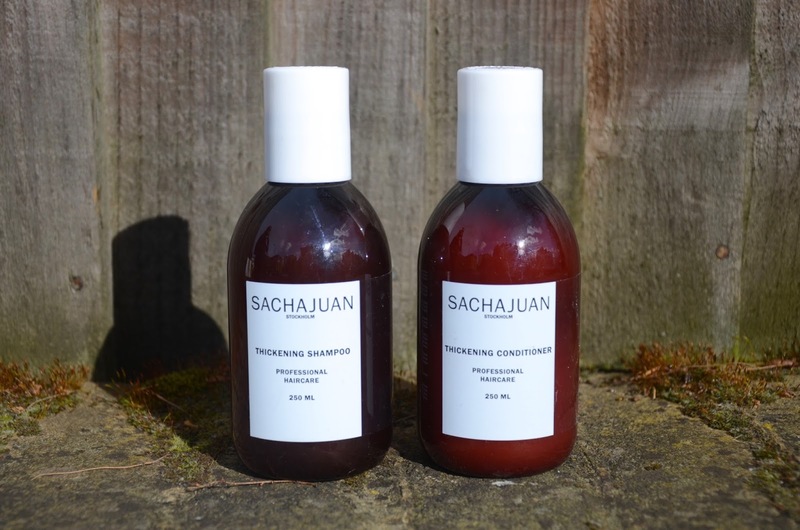 Sachajuan Thickening Shampoo is £20 and Sachajuan Thickening Conditioner is £22. Both are available online via Feel Unique.